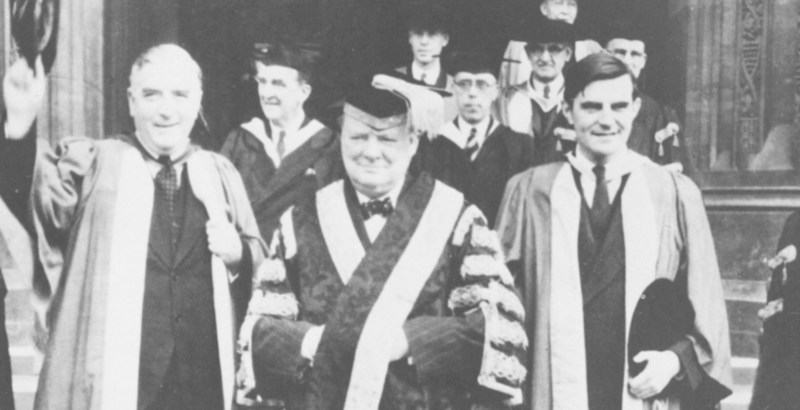 Churchill's Address to Bristol University: What We Mean by "Civilization"
There are few words which are used more loosely than the word “Civilisation.” What does it mean? It means a society based upon the opinion of civilians. It means that violence, the rule of warriors and despotic chiefs, the conditions of camps and warfare, of riot and tyranny, give place to parliaments where laws are made, and independent courts of justice in which over long periods those laws are maintained. That is Civilisation—and in its soil grow continually freedom, comfort, and culture. When Civilisation reigns in any country, a wider and less harassed life is afforded to the masses of the people. The traditions of the past are cherished, and the inheritance bequeathed to us by former wise or valiant men becomes a rich estate to be enjoyed and used by all. The central principle of Civilisation is the subordination of the ruling authority to the settled customs of the people and to their will as expressed through the Constitution. In this Island we have to-day achieved in a high degree the blessings of Civilisation. There is freedom; there is law; there is love of country; there is a great measure of goodwill between classes; there is a widening prosperity. There are unmeasured opportunities of correcting abuses and making further progress. In this very week we have seen a Prime Minister at the head of a large and loyal majority bow with good grace to the customs of Parliament, and we have heard Socialist Members speaking with pride of the precedents of the early seventeenth century, and the principles of the Petition of Right. In this respect for law and sense of continuity lies one of the glories of England And more than that, there also lies in it an important part of her strength and safety. Such episodes are astonishing, but also educative, to countries where dictatorships prevail, and where no one dares to raise his hand against arbitrary power. They stir and cheer the minds of men in many lands. We have, however, to face the problem of the turbulent, formidable world outside our shores. Why should not the same principles which have shaped the free, ordered, tolerant Civilisation of the British Isles and British Empire be found serviceable in the organisation of this anxious world? Why should not nations link themselves together in a larger system and establish a rule of law for the benefit of all? That surely is the supreme hope by which we should be inspired and the goal towards which we should march with resolute step. But it is vain to imagine that the mere perception or declaration of right principles, whether in one country or for many countries, will be of any value unless they are supported by those qualities of civic virtue and manly courage – aye, and by those instruments and agencies of force and science which in the last resort must be the defence of right and reason. Here, then, we see the task which should command the exertions of the rising generation which fills this spacious hall, and which may bring to the life of Britain the surge of a new impulse towards the organization of world peace, and across the gulf of these eventful years prepare and bring nearer the Brotherhood of Man.